Program creates sticky notes on screen. Prompt Sticky Notes is perfect for quick reminders on your computer desktop. 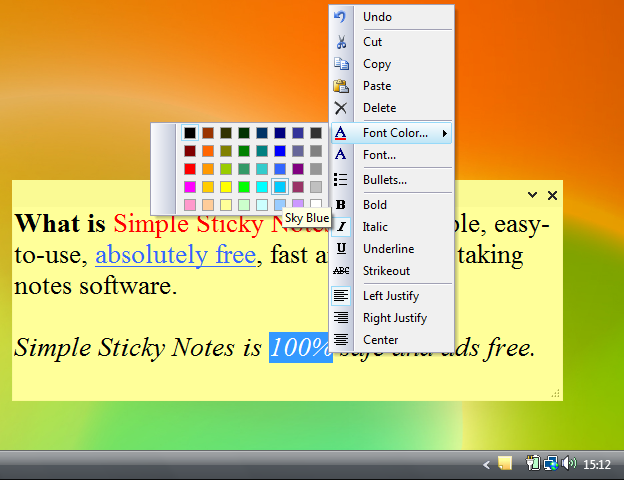 NotesXP is popular note and task manager for Windows with good set of features. Manage files, tasks, sticky, tree and calendar notes easily in intuitive way. Easy to Use Sticky Notes Organizer. Content filter and security system preventing access to the operating system. Topnotes. Organizes and encripts your information in a single file. Collect notes, images, web pages, links and reminders in a tree-like database. Qweas is providing links to Simple Sticky Notes 1.4.6.1 as a courtesy, and makes no representations regarding Simple Sticky Notes or any other applications or any information related thereto. Any questions, complaints or claims regarding this application Simple Sticky Notes 1.4.6.1 must be directed to the appropriate software vendor. You may click the publisher link of Simple Sticky Notes on the top of this page to get more details about the vendor.